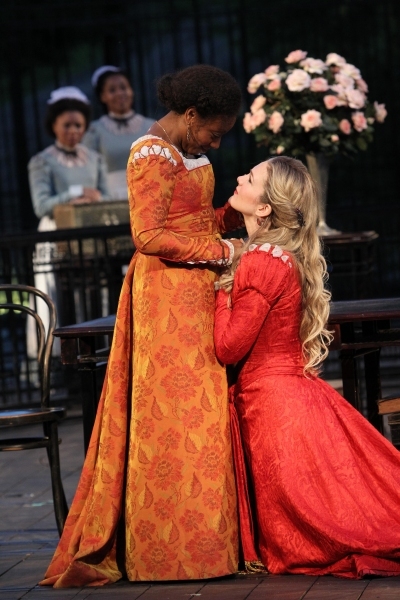 A truth must be told before a review can unfold: I have issues with The Merchant of Venice as a text. One might gasp at the mere thought of questioning the quality of a text by William Shakespeare, or even having reservations about it. Yet here I am, not praising a text that is, by all means, canonical in every way. I might as well throw The Iliad and Pride and Prejudice, along with the rest of the Western canon, on the fire if I plan on attacking The Merchant of Venice. However, it is my issues with the text that make theatrical productions of Merchant worth watching, often due to the bold choices directors must make when staging. How do you deal with the tonal divergence? How do you convey the mixed emotions of the final act? And what do you do with Shylock? These were just some of the questions that Merchant’s creative team, led by Public Theater veteran Daniel Sullivan (who directed last year’s stunning Twelfth Night production), had to tackle when attempting to bring this year’s Shakespeare in the Park headline production. 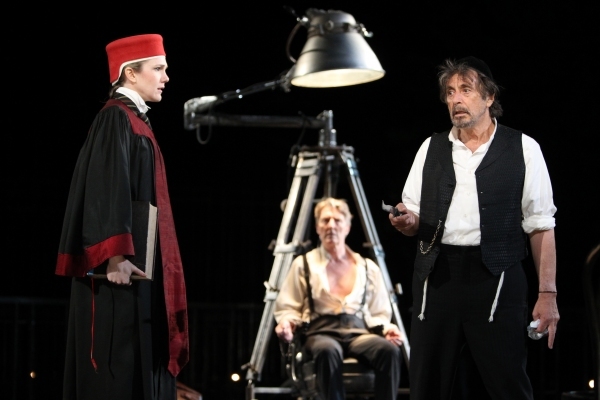 The Merchant of Venice is one of two Shakespeare plays the Public Theater is doing this summer, but the performance of The Winter’s Tale has not been as publicized, as the star power in Merchant is quite overbearing: Al Pacino as Shylock. Pacino’s iconic filmography could reach on forever: The Godfather, Serpico, Dog Day Afternoon, Glengarry Glen Ross, and so. Pacino has also had the pleasure of playing the role of Shylock before in the 2004 film adaptation from Michael Ratford. Pacino plays between the line of villain and tragic figure, and while the actor is known for his sometimes larger than life antics (see here) on screen, he spends a good deal of the play by reserving his biggest emotions. This helps Sullivan and Pacino create Shylock as the tragic figure that so many productions strive for, mainly to avoid accusations of anti-Semitism, but also to give the text a profound complexity in which we are not sure whom to identify with. The tragic side of this comedy occurs not only with the scenes with Shylock, but many of the play’s more comedic sequences are toned down as well. With the riddle of the three chests, Sullivan allows air for only the driest of humor (though there are certain jokes that cannot be made unfunny, and get large laughs). This is wondrously captured through the character of Portia, played by a feisty and energized Lily Rabe, easily giving the play's best performance. Rabe hits the play with a complete dead tone, and acts fearless in her verbal tone, capturing the spite of her situation with her quiet voice but thundering eyes. 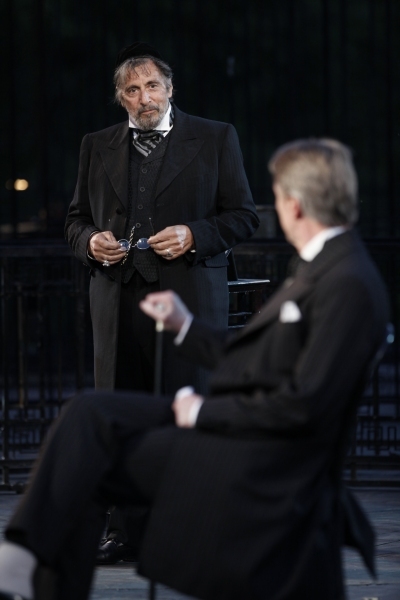 When Shylock and Portia go head-to-head in the production's climax, Rabe matches, if not overtakes, Pacino. The serious tone of most of the actors was also supported by the production’s bleak stage design—a series of black fences were used to separate spaces on the stage, while the play takes place around the turn of the century with uses of phonographs and stock tickers. The stark lighting, which fittingly became darker and more jagged as the moonlight came up around Central Park, made the atmosphere into a one of frantic wonders. The characters of the masked ball are less beautiful than grotesque men and women from what looks like Halloween, and in his most evident deviation from the text Sullivan has added a small sequence of Shylock’s baptism, where the man is literally thrown in and out of the water. In both my reading and watching of theater, one of my main rules is that every play or musical should have a very consistent tone. Don’t get too serious in a comedy. Don’t get too funny in a tragedy. The Merchant of Venice is a problematic text for this reason—it’s fundamentally and structurally a comedy, but the figure of Shylock has become one of tragedy for many scholars and readers alike. The Public Theater has done the best they can to erase the comedy from the production, bringing a height of danger to every scene. And for the most part, it certainly works. We are thrown into a story of frugal spenders, unable to control their own paths, easily deceived, and who none of walk away with a smile on there face, even if there is marriage by the end. Sullivan and his amazing cast have sucked the air out of the theater, leaving us more to ponder than to smile. The crowd walked out quietly into Central Park with many more questions than answers. And for a play that wraps up with everyone getting what they want objectively, it's quite a feat to leave us more confused than ever. See Time Come to a Halt...For Free!